Wait till the Health & Safety Stasi see this! The renewable lobby would like you to believe that solar power is an important part of our future energy strategy. 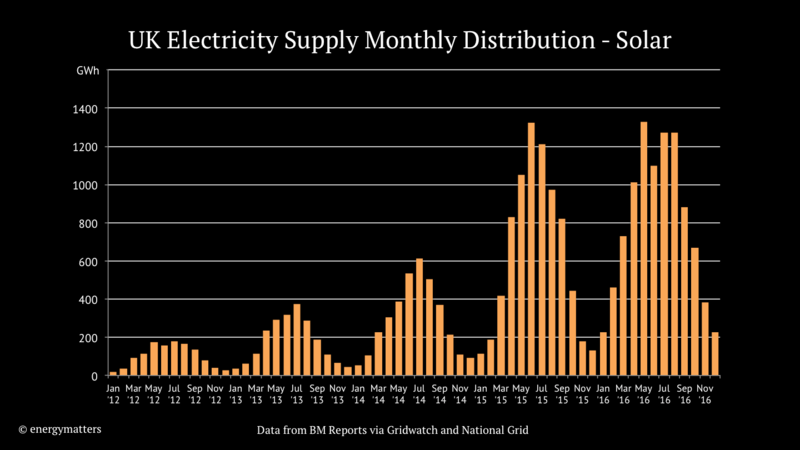 But they don’t tell you just how little power is produced during winter months, at the time when demand is at its peak. Today, solar power briefly peaked at 2 GW, about 4% of total demand. However, cumulatively today it has managed just 7.8 GWh, an average of just 0.3 GW. Today has been a bright, sunny day. Yesterday, however, was cloudy and snowing over most of the country, and solar peaked at just 1 GW. Daily generation has varied between 2.68 GWh and 23.3 GWh in the last month, with a daily average of 11.96 GWh. To put these figures into perspective, current UK solar capacity is reckoned to be 12.6 GW, so for the last month solar power has been running at a tiny 4% of its capacity, with many days well below this. 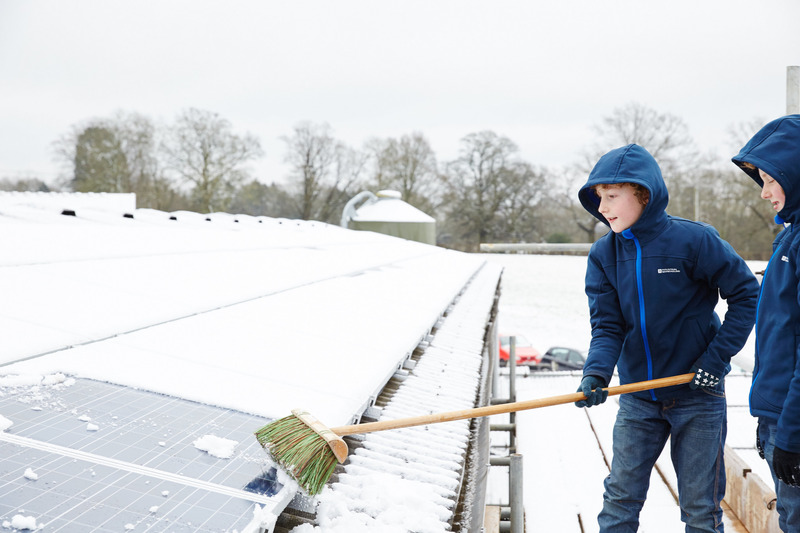 In the overall view of things, solar power is a complete irrelevance in winter months. In fact, it is worse than that, because it forces other generators offline for the few short hours it is actually working. All data is from the Sheffield Solar database, run by the University of Sheffield. Generation data is modelled using actual data from about 26000 sites, combined with PV capacity figures supplied by the National Grid. Official govt data for solar generation is not derived from actual numbers, but is based on estimated load factors. Solar power in perspective. How many businesses would survive running at 4% efficiency – without subsidy? No prizes for guessing. But it’s available from other sources. Hundreds of graphs of UK grid from GridWatch 2012 to 2016. How good are these solar estimates ? Previously Gridwatch didn’t show solar since home solar isn’t live metered there wasn’t a live stat. They’re as good as the capacity figures that the National Grid and BEIS use. As Euan Mearns showed, more wind and solar means higher electricity prices. I think that graph needs up-dating. Australia’s residential electricity prices now rival Germany’s and Denmark’s costs. Despite being in the Eurovision Song Contest, Australia isn’t part of Europe! Do we actually know what solar produced? The figures are a model aren’t they, not actual – and believed an over-estimate according to the appropriate legend on the grid status dial. . I doubt the Sheffield Uni model adjusted for 80% covered in snow anyway! Someone must know how much in subsidies is paid out – and *that* info ought to be in the public domain. Good point we are entitled to know how much is paid out in home solar subsidies and the MWh involved. Hope someone does an FOI. You couldn’t make it up. But our politicians are unbelievably stupid, so they did. Greg “Barking Mad” Barker was the worst energy minister to promote solar in the UK. For his utter stupidity he is now Baron Barker of Battle. How Gilbert and Sullivan would have enjoyed ridiculing in word and music the risible Baron Barker of Battle. How sad that their p.ss taking genius has not been emulated by the pathetic left wing purveyors of comedy today. Don’t worry, it’ll all be OK when subsidised battery storage is added to the mix. Trust me! So after the 10 minutes of battery supply, what next? Quoting from a Grantham Centre project ???? I know how much my pv system generated yesterday. A big fat zero kwh. Solar power is best left to countries that use a lot of air-con and powered fans in their hot summers. That counts Britain out. And on a icy plank with no guard rail and no safety headgear . They soon will not know anything except a lifetime in a wheelchair. We used to sneer at the Victorians who sent children up chimneys to clear the soot .The renewables industry has invented a new variant on an old model. “This is equivalent to taking 3000 cars off the road”. 1) Solar farms merely offset CO2 – since they displace clean-burning gas power stations. So it is totally false to claim they also eliminate N cars-worth of exhaust and congestion. They only offset the CO2 component of the exhaust – and make no difference to road congestion. 2) The number of cars figure is based on the annual CO2 emissions of a car travelling average annual mileage. However this assumption gives a misleadingly high figure – since cars typically spend 96% of the year parked with the engine off. To ‘take a car off the road’ it needs to be driving on the road – so the calculation should use the average CO2 emitted by a car driving at average speed on the road. This reduces the ‘number of cars taken off the road’ figure by a factor of 25. So an accurate claim would be: the output of this solar farm will offset the CO2 of 120 cars driving on our roads – which is considerably less persuasive than the bogus ‘3000 cars taken off the road’ claim. Doubtless if Trump were promoting it, then much witty prose would follow! Some news from Canada – CAUTION: this source is at least as CAGW biased as the BBC. This (already being built) dam was given final approval. A commission of ‘experts’ had earlier suggested – see link below – that its production could be replaced by solar, wind and “industrial load curtailment” and, of course, more energy efficiency (apparently the law of diminishing returns no longer applies). Needless to say, the CBC has NEVER done any reporting on how things are working out in other countries where wind and solar have been heavily deployed, and barely mentions the wind power/skyrocketing electricity rates fiasco in Ontario. ps. great to see Euan comment here. Kudos to Paul, too! Oh dear for an edit capability…. The photo at the top is interesting. There is a little snow but the weather seems fine, and not very cold. Mid-day. There appears to be 2 rows of panels; maybe 500. 2 kids. 1 broom. A need to get the panels clear by sunrise. I think the kids are going to need a second broom. Looks like we are reverting to child-labour too, will be like May Poppins on rooftop units. It seems that panels are even harder to clean in the summer, especially when a long way from water sources. The fouling rates being experienced are not being published, so far as I can find, but are reportedly quite high in dry / dusty climates, so their availability over a few years will certainly fall and they will probably be damaged by the cleaning. Child labour had quite a hand in making the panels too no doubt. Interesting to see Modern Slavery statements appearing on commercial sites now. Just more meaningless box ticking to divert peole’s attention from the anti-suicide nets for iPhone workers in China. And just think of all that fossil fuel burnt in China to produce these ‘chocolate teapots’, to produce PV cells is a very energy intensive process and the mining of [rare earths etc] stuff and then……………shipping it over here, installing it making for leaky roofs, hot water until they break down……….huh? and actually FA electricity – it’s all insane green virtue signalling on stilts…………….wtf? 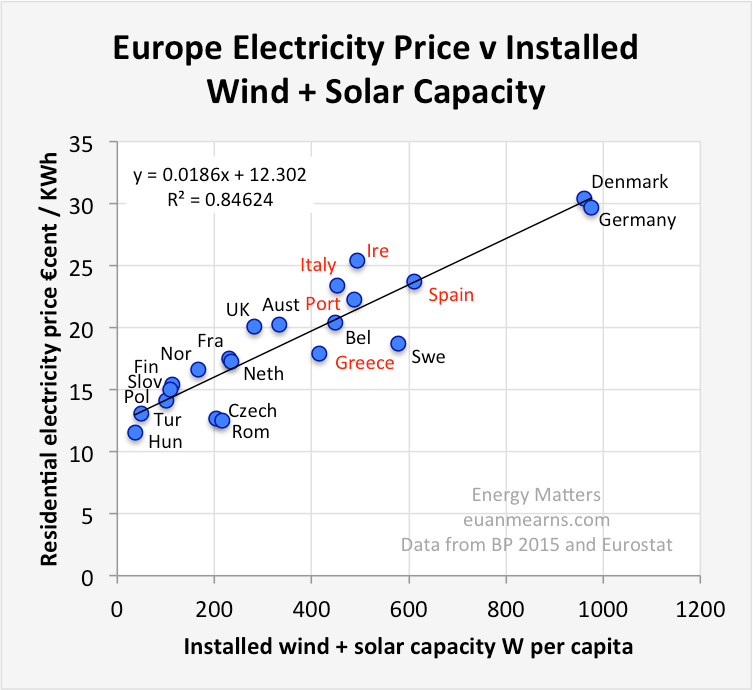 Stark staring bonkers, there is no justification for PV arrays in Britain – none. They look way too close to the horizontal for winter. Down here in ‘sunny’ South Africa’s Highveld (11 degrees yesterday), there’s a good cause for solar for water heating (I’ve got one). But I don’t see much PV stuff, except for the virtue signalling big corporations! OK – I must admit I’ve got a 2-foot square 12v solar panel to power my garden water feature – it works between 09:00 and 15:00. Er, not much use for anything but a toy! Hope you’ve got a Lister in the outhouse to fire up come nightfall. The sound of that is part of my image of life in the beautiful Highveld. At this time, coal and gas generation are at virtually maximum capacity with wind producing just 3.3%. So how do we keep the lights on after coal is completely phased out as planned by 2025 just 7 to 8 years down the road? Same question being sent to Claire Perry. More to the point why isn’t the great British public bouncing up and down about it and why has industry been so quiescent? In reference to Leaving the EU the bbc always bangs on about ‘uncertainty’……………. we are always been told that industry likes certainty – well the threat of no effin electricity when coal is phased out should SURELY be focusing minds – should it not? The British public will be jumping up and down once they get power cuts. It’s at that point they will realise just what a bad job the UK politicians have made of power. Increasing cloud generated by the steadily increasing cosmic radiation will dim the solar output in the decades ahead as we go through solar minimum. Gazing out to sea in Brighton last night I saw all these lights flashing out at sea. took me a while to realise it was a bunch of stupid windmills. Apt that I was there to see The Darkness, something that we will all experience soon.